In anticipation of our first money-free weekend, I went to this recommended website for ideas. There aren't any ideas listed for Greenville, but I did discover information on free botanical gardens in Clemson. The project was born partly out of my own discontentment and partly out of seeing the restlessness of my husband who often complains on Sunday nights, "We didn't even do anything this weekend." It's taken me almost three years to figure out that "doing something" means being outside. Matt's interest and knowledge about nature and wildlife always makes our time outdoors more enjoyable. I love seeing and learning from his enthusiasm. Anything that we can do outside is guaranteed to be healthy for us physically and emotionally. A day spent exploring botanical gardens and nature trails seemed like a good starting off point of the project. Saturday morning, the alarm went off at 7:30. However, after turning off the alarm, Matt pulled me over next to him, and I didn't resist falling asleep again with my head on his shoulder. Sleeping is, of course, a money-free activity and was perfectly appropriate for the weekend. When we got up around 8:00, we filled up on Little Red Wagon granola, which Matt informs me is "man granola," and got ready for the day. 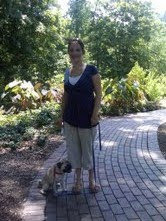 We got to the South Carolina botanical gardens around 10:30. After a few false attempts to find the parking lot, we parked in shady spot from whence many winding paths led off into sunny parks and woods. We gave our little pug dog some water, and set off. Right off the parking lot is a park with a big red caboose. I now want my own. We couldn't go inside, but Henry and I peered in the windows, and it is all set up with a little table, chairs, a bed, and homey curtains. The way I imagine it would be living in a caboose is, I'm sure, more romantic than realistic, but it was fun to imagine. There are paved paths all throughout the gardens. The twists of the paths and the groves of trees make it impossible to see where each path is leading, making each path a possibility. All along the paths are greenery and flowers arranged in a way that shows craftsmanship but suggests happenstance. And I finally understood the appeal of hostas which were ubiquitous throughout the park. Just looking into the gentle green of them made us cooler. Waterfalls flowed into duck ponds which we knew were man made. but we pretended they were natural. We saw very few people in the park, which made the experience even more our very own. After exhausting the paved paths, we venture out onto a more rustic path. Covered in dried pine needles and bordered by countless camillas, it trailed around a large pond. We were well shaded by the tall pines shimmering in the white heat of the sun; and except for the occasional disturbance of a restless frog, the pond was perfectly still. Our walk ended at an eccentric bridge. It was made of concrete and river rocks reddened by the earth around it. At the end of it was a door frame topped with a rough-hewn railroad tie. It was the kind of doorway that made me wonder if walking through it would change us or our lives somehow. Sadly, there were stairs on the other side, so the only change we would have experienced was coming to a dead stop and having to awkwardly turn around. We contented ourselves with looking at it instead. When Henry was as hot as he could possibly stand, we went back to the car to get everyone some water (which, I'd had the foresight to bring with us. No buying water this weekend!). The sun had felt wonderful, but the air condition was a welcome contrast. Matt decided to drive down another hour south to show me Elberton, Ga. He and his friend Chuck often go down there to look for rare species of reptiles. The town of Elberton calls itself "the granite capital of the world." This quantity of granite creates some interesting sights in the city. Throughout the small town, all of the significant signs are carved onto tombstones. It's as though the city and all of it's major attractions have been buried in Georgia's largest graveyard and are remembered on gleaming granite monuments. The churches were old and shabby, but the cemeteries were pristine. Elberton itself is beautifully rustic. It was easy to see why they go down there to find animals. Roads that seem to have no purpose other than to lure out daring snakes looking to steal the last vibrations of heat preserved in the red and white Georgia roads stretch on for miles uninterrupted. When we finally got home it was already past our usual supper time, and we never had eaten lunch. Matt made an executive decision, and ordered us a pizza. I knew that $20 would be needed for occasions such as this! I had made plans to start our nature journal, but again Matt made a decision, and told me to come snuggle with him on the couch. I was happy to obey. We watched a few episodes of The Office, before falling into bed happy and exhausted. Today was filled with church, lunch with Matt's parents, and all those little chores that come with life. Weekend #1 was a success, and I still have $11 to carry with me into next weekend! On different note, I did finish my collage. My camera still is not working, so I'm having to post with pictures from my phone. Hopefully is still gives the basic idea of how it looks. 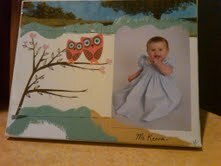 The baby in the picture is my niece McKenna. Tomorrow the tedium begins again. However, we have a visit from my family to look forward to and five days to plan another inexpensive weekend. Christina - thank you! You inspire me. I love and miss you! I love your description of the rustic path that trailed around the pond. Beautiful imagery! Also liked the comment about sleep being a money-free activity.